New research has shown that women typically take twice as long as men before acting on their back or neck pain. 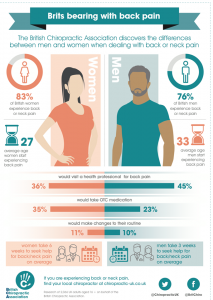 The research, conducted by the British Chiropractic Association, has found a range of other gender differences with regards to back and neck pain. Amongst the results, it was also found that women develop back or neck pain on average, 6 years younger than men, at the age of 27. Despite this a quarter of women have never visited a health professional for their pain. Along with the above, the results found that more than a third of women, 12% more than men, are turning to over the counter medication as their first port of call. This means that nearly a third of women are taking medication before trying methods such as exercise and stretching. Overall, 34% of all people wait at least a month before seeking help, with 10% not seeking any help at all! The results come as a slight shock to those at Morley Chiropractic clinic, where the prevention of such issues are simple and known to us all in the office. However, we recognise this might not be the case for the general public, so we would like to offer a few tips on how to prevent back and neck pain. Sitting is known to be a huge cause of back and neck pain, with 46% of female responders saying that sitting for long periods of time triggered the pain. With this in mind, try getting up and moving around every 30-60 minutes. General exercise. It doesn’t matter too much what you do, but general exercise is fantastic at preventing back and neck pain by increasing muscle tone and coordination. Stretching is a great way to ‘reset’, increase mobility and relax after a hard day. It doesn’t need to anything complex, just stretch the bits that ache for 30 minutes while watching TV on an evening. Nearly a third of women cite that carrying their bag on one shoulder was a trigger for their pain. There are a few solutions for this: make sure you switch shoulders regularly, lighten your load by emptying all unnecessary items out of the bag or switch to backpack to spread the load better. If you have been suffering from back or neck pain, and live in Leeds, Wakefield and Bradford, then contact the team here at Morley Chiropractic Clinic. We offer a range of treatments, from massage, to acupuncture through to traditional chiropractic work. To find out more simply call us on 0113 2383693 or contact us here.